Samuel Goldwyn (August 17, 1879 – January 31, 1974) was an Academy Award and Golden Globe Award-winning producer, also a well-known Hollywood motion picture producer and founding contributor of several motion picture studios. He had an instrumental role in the formation of the two largest Hollywood studios, Paramount Pictures and Metro-Goldwyn-Mayer. Later as a founding member of The Society of Independent Motion Picture Producers (SIMPP) he formed a production company that became the model for the independents who would challenge the big studios. For more than three decades, Goldwyn made numerous successful films and received Best Picture Oscar nominations for Arrowsmith (1931), Dodsworth (1936), Dead End (1937), Wuthering Heights (1939), The Little Foxes (1941) and The Pride of the Yankees (1942). In 1946 Goldwyn's drama The Best Years of Our Lives was his first to win the Academy Award for Best Picture. Goldwyn is remembered as a ruthless businessman whose sometimes crude manners and explosive temper left him with few close friends. He is, nevertheless, known worldwide as a film genius who consistently created quality movies that embodied American ideals for more than four decades. Goldwyn was born Schmuel Gelbfisz in Warsaw to a Polish Jewish family. The oldest of six children he left Warsaw at age 15, when his father died. He left home on a foot-journey across Europe. Making his way to Birmingham, England, he remained with relatives for a few years using the Anglicized name Samuel Goldfish (later to become Goldwyn). In 1898, he emigrated to the United States, but fearing refusal of entry, he got off the boat in Nova Scotia, Canada before moving on to New York in January 1899. He found work in upstate Gloversville, New York, in the bustling garment business. Soon his innate marketing skills made him a very successful salesman. After four years, as vice-president for sales, he moved back to New York City. Goldwyn became a naturalized citizen of the United States in 1902. At the time, the fledgling film industry was expanding rapidly and in his spare time, an enraptured Goldwyn went to see as many movies as possible. Before long, he went into the business with vaudeville performer Jesse L. Lasky, his brother-in-law at the time, and Adolph Zukor, a theater owner. They formed the Jesse L. Lasky Feature Play Company and produced their first film The Squaw Man, using an ambitious young director named Cecil B. DeMille. With DeMille in charge of the filmmaking and Lasky serving as producer, Samuel Goldfish was in charge of marketing. Though he never received screen credit, his partners credited him with being the business mastermind behind the operation. The success of the company spawned a merger with Adolph Zukor’s Famous Players. Once Famous Players-Lasky was created Goldfish began to take a greater role in the production of films and in the administration of the company. Within months of the merger in 1916 he managed to alienate his new partner Zukor, his brother-in-law Lasky, and the studio’s biggest star Mary Pickford. As a result he resigned, selling his $7,500 initial investment for $900,000. Famous Players-Lasky later evolved into Paramount Pictures. In 1916 Samuel Goldwyn partnered with Broadway producers Edgar and Archibald Selwyn, using a combination of both names to call their movie-making enterprise the Goldwyn Pictures Corporation. Seeing an opportunity, Samuel Goldwyn had his surname legally changed from Goldfish in 1918. The Goldwyn Company proved moderately successful with their "Leo the Lion" trademark becoming an industry icon. Eventually the company was acquired by Marcus Loew and his Metro Pictures Corporation but by then Samuel Goldwyn had already been forced out by his partners and was never a part of the new studio that became Metro-Goldwyn-Mayer. After his departure from Goldwyn Pictures Corporation, he established Samuel Goldwyn Inc., eventually opening Samuel Goldwyn Studio on Santa Monica Blvd. in West Hollywood. For 35 years, Goldwyn built a reputation as a filmmaker with an eye for talent. He discovered actor Gary Cooper, used director William Wyler for many of his productions and hired writers such as Ben Hecht, Sidney Howard and Lillian Hellman. For more than three decades, Goldwyn made numerous successful films and received Best Picture Oscar nominations for Arrowsmith (1931), Dodsworth (1936), Dead End (1937), Wuthering Heights (1939), and The Little Foxes (1941). The leading actors in several of Goldwyn films were also Oscar-nominated for their performances. Throughout the 1930s, Goldwyn released all his films through United Artists, but beginning in 1941, and continuing almost through the end of his career, Goldwyn released his films through RKO. His success was based on the belief that storytelling was the singular element in a successful movie. Many independents who followed, including David O. Selznick, Walter Wanger, and even Walt Disney, operated their businesses after the Goldwyn model. That meant—small units overseen by a single creative producer, only a few films a year, all of them A-class productions. To a large extent, this has remained the model for success followed by most of the top independent production companies in Hollywood history. The Society of Independent Motion Picture Producers (SIMPP) had its origins in the great anti-trust battle between the U.S. government and the large Hollywood studios which enveloped the industry in the late 1930s. Though most of the independent producers distributed their films through the Big Eight studios, the independents opposed the studio monopolies, and joined the side of the U. S. Justice Department in attacking the majors. The independent producers joined together to fight the studios collectively, and to use the society to help secure a place for independents in an industry dominated by big business. When the government temporarily called off the antitrust suit in 1940, the independents decided to join together. The unification of the independent producers in Hollywood had been rumored several times since 1940 when the government's consent decree took effect. Whenever any of the prominent producers were queried about their plans to organize their own trade organization, they admitted only that such an alliance was "under discussion." The Society began to take shape in secrecy throughout 1941. Along with Goldwyn, the founding members were Charles Chaplin, Walt Disney, Alexander Korda, Mary Pickford, David O. Selznick, and Walter Wanger. In 1946, the year he was honored by the Academy of Motion Picture Arts and Sciences with The Irving G. Thalberg Memorial Award, Goldwyn's drama The Best Years of Our Lives, starring Myrna Loy, Fredric March, Teresa Wright and Dana Andrews, won the Academy Award for Best Picture. With only brief interruptions in his production output over a 30-year span, Goldwyn released his seventy-eighth film Hans Christian Andersen (1952) which became his last RKO release, and his final production as a SIMPP member. In the 1950s he also made a number of musicals including the 1955 hit Guys and Dolls starring Marlon Brando, Jean Simmons, Frank Sinatra, and Vivian Blaine. This was the only independent film that Goldwyn ever released through MGM. Two years later, in 1957, he was awarded The Jean Hersholt Humanitarian Award for his outstanding contributions to humanitarian causes. In his final film the 82 year-old Goldwyn made the $7 million musical Porgy and Bess (1959), bringing together African-American actors Sidney Poitier, Dorothy Dandridge, Sammy Davis, Jr. and Pearl Bailey in a film rendition of the George Gershwin opera. Released by Columbia Pictures, the film was nominated for three Oscars, winning one, and also won the Golden Globe Award for Best Motion Picture-Musical/Comedy. Goldwyn was wheelchair-bound after a debilitating stroke in 1969. He died at his home in Los Angeles in 1974 from natural causes. He was interred in the Forest Lawn Memorial Park Cemetery in Glendale, California. In 1973 he was honored with the Cecil B. DeMille Award for lifetime achievement in motion pictures. Goldwyn was married to Blanche Lasky from 1910 to 1915. In 1925 he married actress Frances Howard, who remained with him for the rest of his life. Their son, Samuel Goldwyn, Jr., would eventually join his father in the business. 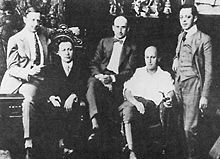 Samuel Goldwyn's grandsons include Francis Goldwyn, founder of the Manhattan Toy Company and Managing Member of Quorum Associates LLC, actor Tony Goldwyn and film producer John Goldwyn. His granddaughter, Catherine Goldwyn, created Sound Art, a non-profit organization that teaches popular music all over Los Angeles. His other granddaughter, Liz Goldwyn, did a film on HBO called Pretty Things, featuring interviews with queens from the hey day of burlesque; her book, an extension of the documentary titled, "Pretty Things: The Last Generation of American Burlesque Queens," was published in October 2006 by HarperCollins. In the 1980s, Samuel Goldwyn Studio was sold to Warner Bros. There is a theater named for him in Beverly Hills and he has a star on the Hollywood Walk of Fame at 1631 Vine Street. Goldwyn is remembered as a ruthless businessman who lacked formal education and his sometimes crude manners added to an explosive temper that left him with few close friends. He nevertheless was a film genius who believed in quality and who not only survived, but prospered in an extremely competitive business. On the passing of former partner and arch rival Louis B. Mayer, he is quoted as saying: "The reason so many people turned up at his funeral is that they wanted to make sure he was dead." Several years after the Sr. Goldwyn's death, his son, Samuel Goldwyn Jr., initiated an independent film and television distribution company dedicated to preserving the integrity of Goldwyn's ambitions and work. The rights to the classic Goldwyn library (among other pre-1996 Goldwyn company holdings) are now held by MGM. Samuel Goldwyn's will created a multi-million dollar charitable foundation in his name. Among other endeavors, the Samuel Goldwyn Foundation funds the Samuel Goldwyn Writing Awards, provided construction funds for the Frances Howard Goldwyn Hollywood Regional Library, and provides ongoing funding for the Motion Picture & Television Country House and Hospital. The Samuel Goldwyn Theater is located at the Academy of Motion Picture Arts and Sciences headquarters, 8949 Wilshire Boulevard, Beverly Hills, California. The world-class theater is custom designed to present films at maximum technical accuracy, with state-of-the-art projection equipment and sound system. The theater’s 1,012 seats have been specially designed and placed to create a movie-viewing environment that is ideal in terms of acoustical quality, sightlines and comfort. Goldwyn was awarded the Presidential Medal of Freedom by President Richard M. Nixon on March 27, 1971. Anticipating Yogi Berra by a generation or so, Samuel Goldwyn was famous for malapropisms, paradoxes, and other speech errors that came to be called 'Goldwynisms'. He had a great wit and because his native tongue was Yiddish he sometimes stumbled on English and said unintentionally funny things. His press agent collected the funniest of his remarks and began planting them with columnists. ↑ 1.0 1.1 1.2 1.3 Hollywood's Lone Wolf Cobbles.com. Retrieved November 18, 2008. ↑ J.A. Aberdeen, The Formation of the Society (1941 & 1942) Cobbles.com. Retrieved November 18, 2008. ↑ Floyd Conner, Hollywood's Most Wanted p. 28. Books.google.com. Retrieved November 18, 2008. ↑ Samuel Goldwyn Theater Oscars.org. Retrieved November 18, 2008. All links retrieved December 20, 2013. American Masters: Sam Goldwyn Pbs.org. Aberdeen, J. A. 2005. Hollywood's Lone Wolf Cobbles.com. Macnab, Geoffrey. 2004. Samuel Goldwyn Jr: A Goldwyn inheritance Independent.co.uk. This page was last modified on 20 December 2013, at 16:05.